India's ongoing bipolarity in political discourse was on display in the past few weeks. A standard exercise to create a comparable data set on gross domestic product (GDP) erupted into a meaningless Congress v BJP duel. In 2015, India changed the methodology to measure GDP. It was but inevitable for normal tracking of the economy to create a comparable data set for years preceding this year. The result showed that the former United Progressive Alliance (UPA) apparently performed better on economic growth than the current National Democratic Alliance (NDA). After intense debates from both sides, the government withdrew the study. In July, the US also changed certain measures of the economy that led to a change in both the current and the past GDP growth. It showed that the second term of Barack Obama registered a better growth than the Trump regime. But there was no senseless politicking over it. Rather, there was a debate over whether GDP could be the only measure of economy. That is precisely what the current debate in India missed. GDP as a measure of economy and state of welfare is increasingly being debated. In 2016, the then chief statistician of India T C A Anant was quoted in this column saying that GDP was an imperfect indicator. Then, the debate was over the new methodology adopted for measuring India’s GDP. Worldwide, economists are questioning GDP more and more as it doesn’t show the state of welfare, or to put it in simple language, doesn’t reflect whether a booming economy results in public welfare. Like, many point out, if India was the fastest growing economy, then why was poverty reduction not proportionately faster or why farmers across the country continue to be distressed? GDP is not meant to indicate all these as it is not a measure of overall welfare. For example, Kerala’s GDP would go up after the flood as there would be fresh investments to rebuild the state. But this does not mean people’s lives will improve. For that matter, an unhealthy country would add on to GDP due to people spending more on treatments. Simon Kuznets, who invented GDP, cautioned the US Congress in 1934 that it was an “inaccurate” calculation and was not meant to assess an economy’s true welfare nature. So, why is this obsession with GDP? A higher economic growth has more political meaning than any welfare trickle to the poor. 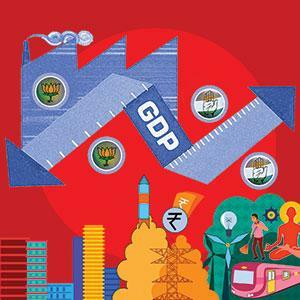 Parties use GDP rate to whip up public passion and reap electoral gains. Particularly, since GDP and liberal economy became global parameters, its political importance, too, has gone up. It is also being used to attract foreign investments. The real danger is that obsession with just boosting GDP keeps policy-makers away from relevant economic investments needed to ensure welfare. For instance, investing in a big export-oriented mobile phone factory drives GDP growth, but it cannot match human development in the same way as investment in schools and hospitals. But given the political traction of GDP, a leader would tend to prefer the former. That could be the reason why agriculture trade has gone up in India but we are importing more without substantial domestic investment in the sector. So, there was an opportunity to turn GDP into a debate over its efficacy. That would have been a sign of a “New India”. But by defending first and then withdrawing the report, we just became the usual India for the sake of narrow politicking. (This article was first published in the September 1-15 issue of Down To Earth). Can the Walmart-Flipkart deal ease the woes of Indian farmers?